As Venezuelans’ desperation for basic staples boils over (watch the video above if you don’t believe me), today the government had a little PR meltdown, courtesy of Food Minister Carlos Osorio. 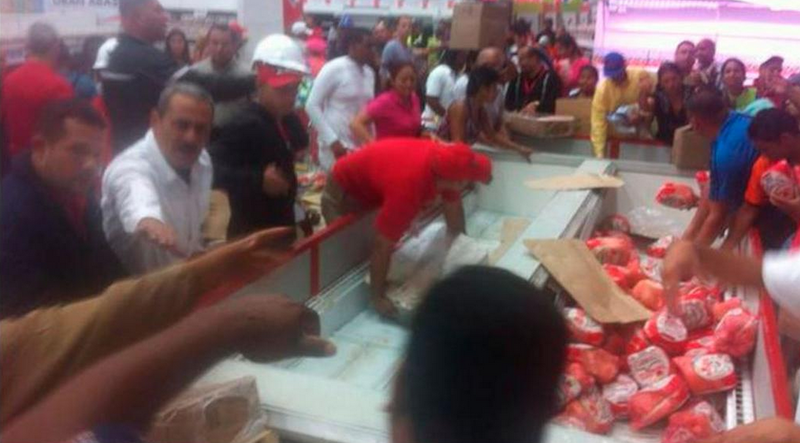 Starting early in the morning, government bureaucrats started tweeting pictures of an apparently clean, orderly, well-stocked Bicentenario supermarket in Plaza Venezuela. As the day rolled on, though, a different story emerged, with Twitter users showing enormous lines on the outside of the supermarket, whose official opening will take place two days from now. As Food MInister Carlos Osorio toured the place on TV, apparently … the chicken arrived! The desperate mobs lunged for the poultry, while an increasingly desperate minister tried to calm them down. His handlers immediately shut the video feed down, although some of it made its way outside. Of course, I wasn’t there, so it’s hard to know exactly what transpired. All I know is what everyone who covers Venezuela knows: the situation … is critical. Even the even-keeled Ángel Alayón is brilliantly ruminating on what scarcity does to your psyche – that’s how bad things are. People are angry, and increasingly desperate. The scarcity + inflation combination has never felt this bad. HT: The great Miguel, for the video.